Alex McLeish’s men looked certain to have claimed their Old Firm first point this season after defending stoutly and keeping out all Celtic’s attacks for the best part of 91 minutes. With Hugh Dallas preparing to blow the final whistle, Chris Sutton worked an opening between the Rangers defence and lobbed a delicate effort over the head of Stefan Klos from just outside the box. 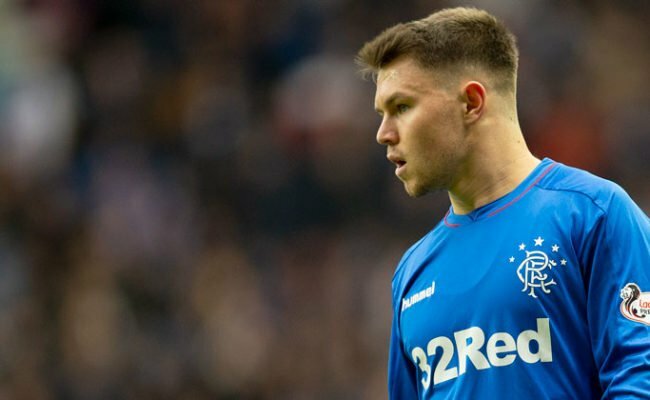 It was tough luck on a Rangers side that had battled well against evidently superior opposition but once more signalled the improvements that will be expected from McLeish and his side next season. Looking to avoid a whitewash of Old Firm defeats, the Gers manager’s options had again been limited as he penned his starting line-up. Hamed Namouchi was the latest name to be added to the long-term wounded meaning Michael Mols returned to partner Steven Thompson up front in an otherwise unchanged line-up from the side that put four past Motherwell the previous week. Four long years have passed since Rangers last recorded a victory in this part of town and it looked ominous once more when Celtic had the ball in the net with just three minutes gone. Alan Thompson curled in a wicked free kick – the first of many to trouble the Rangers defence – and Stanislav Varga bundled the ball past Stefan Klos. As he wheeled away in delight, however, Hugh Dallas cut the celebrations short, blowing for Henrik Larsson’s earlier foul on Frank de Boer. Buoyed by their let-off, Rangers enjoyed a short stay around the Celtic box, with Ricksen seeing a shot deflected before Bobo Balde messily conceded a corner with Steven Thompson harrying him. Celtic, however, have tended to dominate these proceedings of late and this afternoon was no different as free kicks and corners were sent in with worrying regularity. Larsson swept in a free kick that Klos dived on gratefully before the goalkeeper had to look alert to claw away a dipping header from the Swede with Chris Sutton breathing down his neck. 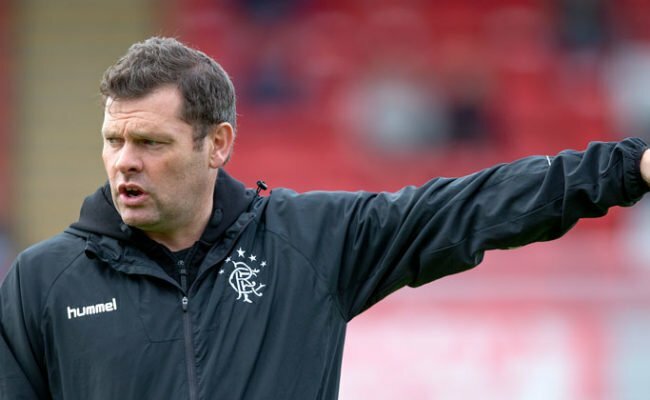 Sutton was his usual menacing self, winning free kicks and climbing all over the backs of the Rangers defence as if trying to manoeuvre himself over an obstacle course. The Light Blues led a charmed life for the best part of 10 minutes, with headers flying high and wide of Klos’s goal from Thompson’s deadly deliveries. After reeling on the ropes, Rangers started to fight back with a few chances of their own as the interval approached. Stephen Hughes had two shots deflected over before David Marshall was called into action for the first time to keep out de Boer’s glancing header from Mikel Arteta’s corner. 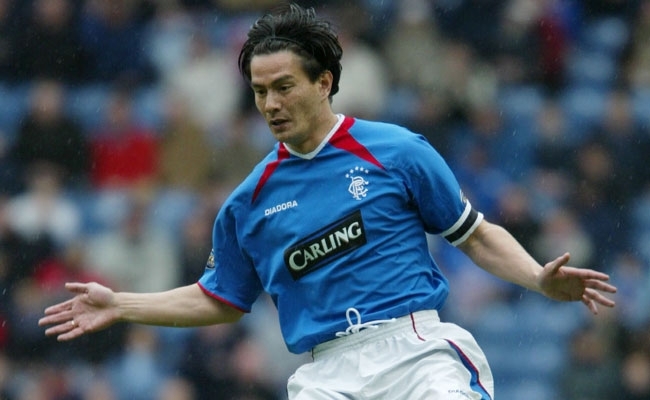 Moments later and Michael Mols worked room to send in a powerful effort that Marshall could only parry. Thompson arrived too late to convert the rebound opportunity. 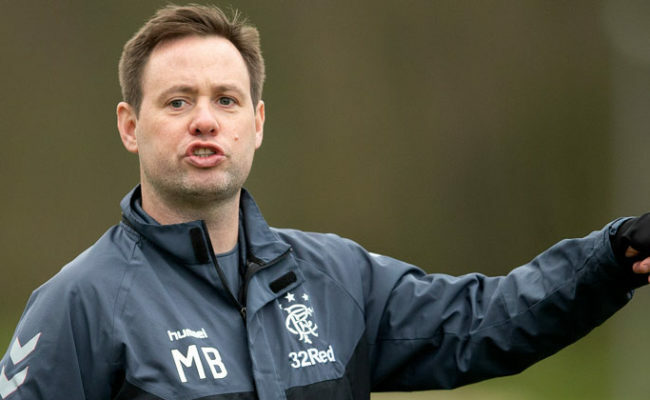 Rangers’ lack of firepower has been well-documented this season and never was that clearer illustrated than just before the half-time break when Chris Burke sent a teasing centre across the six-yard box that found no takers. After a relatively placid first half, the second period reverted to type with Hugh Dallas flashing more cards than a Las Vegas croupier, both sides eventually picking up three bookings apiece. Celtic were again pushing Rangers on to the back foot, with Thompson and Mols looking increasingly isolated as play raged on 60 yards away. As Celtic upped the pressure, Arteta hacked a Varga shot off the line before Klos pulled off a fingertip block to deny Petrov. The Bulgarian should have done better just after the hour mark when he latched onto Larsson’s through ball but was unable to direct his back post effort on target. 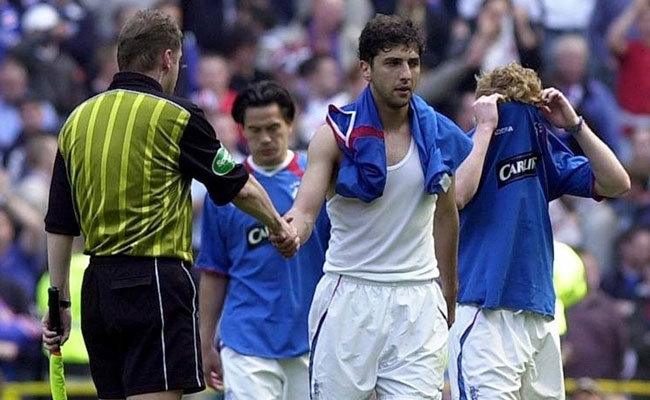 For Rangers fans, this was a time to be hiding behind the sofa and watching through the cracks in your fingers. Klos, as ever, was virtually single-handedly repelling the Celtic attackers who by now were peppering his goal with headers and shots. Alan Thompson sent a free kick sailing into Klos’ arms before Sutton, Varga and Balde all saw headed efforts kept out by the peerless German keeper. This was an endless Celtic siege broken only by a rare Rangers attack, Marshall clearing Arteta’s through ball with his head as Burke looked to fasten on to the pass. Just when it looked as if they has survived the onslaught, Celtic once more stabbed a dagger through Rangers’ hearts. With the game deep into injury time, Larsson and Sutton worked a 1-2 before the Englishman sent a delicate lob over Klos that landed sweetly into the net.